Well, it’s the dead of winter, and there is little that is green in the northeast landscape this time of year. (Surprisingly, this winter, there is little that is white, but that’s another story). Peering carefully at the forest floor, we might find green mosses (see Ulota) and ferns (see Dryopteris spp. ), but overhead the forest canopy is mostly leafless. Only our native evergreens, cone- and needle-bearing species, many of them members of the Pine family, are green and active, soaking up whatever sun they can while the flowering trees lie dormant. Eastern hemlock (Tsuga canadensis) is one of my favorites. Frequent on the moist, cool slopes that line the gorges of the Finger Lakes, eastern hemlock is also found in upland forests, along with sugar maple, birch, and American beech. The species is restricted to the cool regions of North America, ranging from northeastern Minnesota and western Wisconsin eastward through southern Ontario and Quebec, and northward into New Brunswick and Nova Scotia. Eastern hemlock occurs in New England, New York, Pennsylvania, New Jersey, and the mid-Atlantic states. Southward the species is found in the Appalachian regions of northern Georgia and Alabama. Among the conifers, eastern hemlock is easily recognized. The mature trunk is reddish brown in color, and deeply furrowed. Bearing short (1/2 inch), flat, single needles in a two-ranked array, the thin brown branches have a light, feathery appearance. The underside of each needle bears two rows of white lines running parallel to the midrib. These lines contain pores with the stomata that regulate the flow of water vapor and CO2 during photosynthesis. Hemlock cones are diminutive, with papery scales. Maturing in the fall, they dangle delicately from the branch tips, dispersing small, light seeds into the winter. Hemlock trees are extremely shade tolerant, slow growing and long-lived. They are said to live for hundreds of years; one individual, felled by a windstorm in 1989 at Smith Woods in Trumansburg, NY, was determined to be over 315 years old. A mature eastern hemlock individual can be 80 or more feet tall, and have a diameter at breast height (dbh) of 30 inches. The tree has a dense, conical crown, and often the most terminal branch droops to one side. These tall, aged individuals are an important presence in the mature forest, providing excellent cover and food for white-tailed deer, ruffed grouse, wild turkey and several songbird species. Hemlock timber was once prized for the high tannin content of its bark. Consequently, in many parts of its range the species only persists on steep wooded slopes where it was inaccessible to logging. Barns were often sided with hemlock lumber, and you can still occasionally see the warm, gray patina of hemlock siding on ancient local barns. 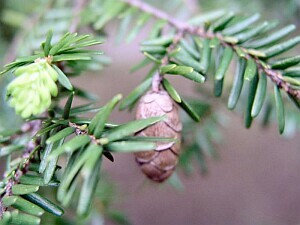 An important species in the northeast, both ecologically and historically, eastern hemlock today is threatened by the hemlock wooly adelgid, an introduced sap-sucking insect that has caused extensive decline and mortality of hemlock over nearly half of its range. Though there are efforts underway to control the adelgid using chemical and natural means, the pest is expected to continue its spread.